Carl J. Crosley, MD is the Professor Emeritus of Neurology and Pediatrics at the Upstate Medical University in Syracuse, New York. At that institution he has held numerous position of administrative and education responsibility during his almost 40 years as a member of the faculty. His clinical expertise has been established with special interests and clinical settings focusing on the care of children with epilepsy, cerebral palsy, brain tumors, and headaches. His clinical practice included care for over 1,800 children each year. His role as a medical educator was rewarded with regular recognition by his trainees. His investigative efforts focused predominantly on the evaluation of new treatments for epilepsy. At the national level he has been a member of the American Academy of Neurology for over 40 years. As a career long member of the Child Neurology Society he has served in a number of committee and executive roles. 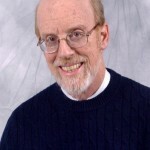 He served as a certifying examiner for the American Academy of Psychiatry and Neurology for over 20 years. He has published several dozen articles in peer reviewed journals related to pediatric epilepsy, pediatric muscular dystrophy, pediatric brain tumors, and congenital anomalies. Given the prevalence of headaches in children it is natural that as a pediatric neurology clinician-educator his care for children with headaches would occupy a prominent part of his practice. A fourteen-year-old boy is confused. He has a headache. He has just come home from football practice. A nine-year-old girl doesn’t want to go to school. She says her head hurts. Again. A six-year-old girl has been vomiting multiple times overnight. Her parents remember the last time she couldn’t stop vomiting. It lasted a whole day, leaving her dehydrated and having to go to the emergency department. These are common scenarios for children with headache(s). Headaches can be frightening, especially if parents are witnessing their child suffering. Parents’ fears can be rooted in concern for the pain their child is experiencing and in the uncertainty that a headache may be a symptom of a serious condition. Additionally, parents can be frustrated by their limited ability to make things better. The following article is offered to help parents understand headaches, as well as provide some basic tools to help their child. What was the child doing when the headache began? Where on the head is the pain? What is the character of the pain (e.g. dull, sharp, steady, and throbbing)? special considerations, including if the child is dizzy, has trouble seeing or is seeing strange things, vomiting (a lot or even occasionally), or having difficulty walking or talking. Headaches at night are always disturbing, but more importantly a parent should note whether the headache begins in the middle of the night or simply continues through the night from the evening. Occasional headaches in children are common and affect almost one-half of children by age seven, and almost three-fourths of children by age 15. Frequent or recurring headaches are less common, but still affect almost 15% of adolescents. An individual headache may be associated with and explained by an illness, such as an upper respiratory tract infection (e.g. influenza). However, a headache without a reasonable cause, headaches after an apparently minor injury to the head, and recurrent or persistent headaches will raise concerns of a serious brain problem. This is fortunately rarely the case. Despite the absence of a damaging underlying brain disorder being present in almost all children with headaches there are some children who have severe enough or frequent enough headaches to affect their family, school, and social lives. Headaches are not fatal, but the recurring pain of headaches can harm and degrade the quality of a child’s life. To understand headaches and how to treat and prevent them, it is necessary to first provide a clear description of the many different kinds of headaches. The International Headache Society has developed a classification of headache types and has recently updated these essential guidelines. Primary headaches are those in which the headache is the problem by itself and there is no underlying or additional medical problem. Tension type headaches are the most frequent primary headache. Occasional tension type headaches will occur in one-fifth of adolescents. They may last minutes but rarely days. The pain is often described as pressing or tightening. It is on both sides of the head. It does not worsen with physical activity and there is no nausea. Scalp tenderness is uncommon, but may be present. For some children the episodes are more frequent and may actually occur almost half of the days of the month for several months in a row. Even less common is a headache of this character that occurs more than half of the days of a month for more than half of the months of the year. An occasional child will actually be able to report the exact day or several days that a virtually daily headache had begun. This is known as New Daily Persistent Headache. Migraine is the other common primary headache. Occasional migraine headaches will occur in about 10% of adolescents. Its characteristic quality is a pulsating, throbbing pain. It may be only on one side of the child’s head, but most commonly it is located in both front and temple regions. It is very uncommon to be only in the back of the head. Migraines are generally more severe than tension type headaches. They are aggravated by physical activity and frequently accompanied by nausea and vomiting. Light and sound sensitivity are additional characteristics. They will last more than one hour at the very least but may go on for several days. 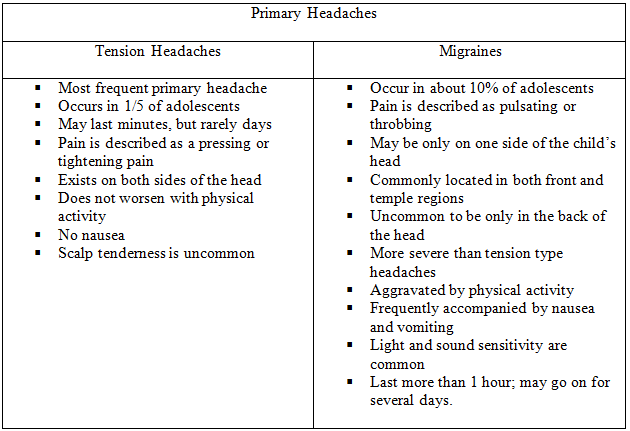 Despite these differences, it may take several episodes to differentiate between infrequent tension type headaches and migraine. Some children will have temporary neurologic symptoms at the beginning of the headache. With the addition of these symptoms, the child is considered to have migraine with aura. This will happen to only 10–20% of adolescents with migraine. Many of the symptoms are visual; either as lights or spots or loss of vision in part of the child’s visual field. Numbness, tingling, garbled speech and other temporary symptoms can also occur. These symptoms generally precede the headache by several minutes but may last through the beginning of the headache. It is distinctly uncommon for them to last for 10-30 minutes. In addition to the more obvious types of migraines, children may experience several other patterns of symptoms that we now recognize as part of the migraine picture. They are recognized as patterns that are likely in older children to become a migraine. Therefore, children who have these phenomena are likely to develop ordinary migraine. Cyclic vomiting is the most significant of these patterns. Instead of the problem starting out with a headache, the child will have a usually brief period of dizziness and then quickly proceed to serial and prolonged vomiting. Typically, they will vomit four or more times each hour for one or more hours. This is clearly different from the more ordinary headache event where headache is the major symptom, and if a child vomits it will only be several times over the hours of the headache. The child may continue to vomit sufficiently to become dehydrated and require care at a pediatric emergency department. The children are typical perfectly well in between attacks, which generally occur only a few times each year. Other children will have a similar pattern of episodes but their main symptom is abdominal pain. The pain is dull or “just sore” but generally severe. They will have some nausea and only occasional vomiting. very young children may have episodes that are brief spells of dizziness and no other symptoms. This is called benign paroxysmal vertigo of childhood. The spell will begin quickly and resolve in a few minutes or less commonly a few hours. Toddlers who are having these episodes may not be able to express their discomfort verbally and simply and inexplicably become quiet and resist motion. Some of these children will actually have a rapid shimmering of their eyes formally known as nystagmus. Vomiting does not usually occur. A rare form of migraine is accompanied by severe weakness or even paralysis on one side of the body. This hemiplegic migraine may actually be seen in several close family members. While structural brain problems – including abnormal vessels and even tumors – can cause headaches, it is uncommon for these to be the only symptom or sign. This is true when the headache problem has been present for a number of months and the child is otherwise well. A single headache can be the beginning of a long-term headache problem or more often the symptom of an illness (usually viral). For that reason, physicians caring for children with headaches are hesitant to predict the child’s future until several episodes (usually five) have occurred. Certainly there are exceptions to this practice. A persistent headache that has begun after an injury is looked at much more critically and with a detailed physical examination. When a headache is prominent in the context of an obvious infectious illness, that illness is evaluated for the potential of being a more serious infection than it first may have appeared. In the case of the child who ultimately turns out to have cyclic vomiting, the severe early vomiting will lead to a detailed gastro-intestinal investigation. However once other conditions have been eliminated and the headache episodes are still recurring, the physician’s care will be focused on the child’s headaches. For example, if a child has a headache with the flu, the headache is treated as a symptom of the flu. However, if a child is having a migraine AND the flu, then the child has two illnesses for which the physician now has to provide care. While an individual headache can be attributed to a specific trigger, the tendency to have headaches as a response to things such as stress, foods, and weather is a primary biology characteristic of the child. For children with relatively frequent headaches, the cause and effect conclusion should be made cautiously and not until the pattern is clearly established. Some specific headache syndromes, such as hemiplegic migraine, are very hereditary and migraines are likely to be found in a child’s parent, sibling, grandparent, aunt, uncle or first cousin. The actual physical causes of migraine have become more clearly understood over the past two decades. In the early twentieth century, scalp over-activity of the scalp muscles was blamed for causing headaches. While excessive scalp muscle contraction can and does occur in the context of a migraine headache, this phenomenon is not the primary process but a secondary or even more distantly related part of the migraine headache. By the mid twentieth century, it was thought that constriction of blood vessels supplying parts of the brain caused selective areas of decreased blood flow and produced the warning signs or aura. The pain of the headache was then the result of the reactive over dilation of brain blood vessels that stretched the nerves supplying them. Subsequently, some of this assumption was proved to be incorrect and other parts of this sequence were recognized as secondary to the headache and not the cause of the headache. Of course some adults and most children do not have aura. For at least the last 20 years, evidence has built up to more clearly understand the processes that cause and maintain migraine headaches. It is recognized that in some individuals, selective nerve cells overreact to ordinary stimuli (i.e. any detectible changes in the environment). This overreaction suppresses nearby brain activity which in some cases will produce the aura or warning that can precede migraine headaches. The pain the children then experience is related to the subsequent inflammation of the vessels covering the brain by small molecules called peptides. In addition, these substances over-activate the nerve fibers that carry sensation to the scalp, the face, the brain blood vessels, and the brain coverings. This complex process, especially with the interplay between the various aspects, has given a variety of specific headache pain treatments as opposed to general body pain treatments. This distinction is critical in the approach to preventing and stopping migraine headaches. When pain is experienced – other than headaches – it is because of an injury or an infection. In migraine headaches, pain is experienced, but nothing has been injured or infected. The description of the headache(s) and the child’s general history are the key ingredients in making the diagnosis of headache and determining the type of headache. The additional evaluations that may be considered are not for making the diagnosis of headache, but for excluding disorders other than primary headache. The greatest number of x-rays and laboratory tests are likely to occur with the first headache, especially when there is no other illness to account for the headache. In instances where a child has had a fever for awhile with respiratory congestion and/or muscle aches, an evaluation will focus on an infectious illness such as influenza. The consideration of an infection of the nervous system, such as meningitis or encephalitis, would then depend on other issues such as a stiff neck or a less than normal state of consciousness, confusion, and delirium (not reasonably explained by fever and similar general symptoms). In a child who has an isolated, critically severe headache that persists for hours, the consideration of a sudden critical brain injury or even brain bleeding is sometimes necessary. In the child presenting with cyclic vomiting, hormonal and gastrointestinal evaluations and x-rays are often performed. Blood and urine tests, as well as spinal taps (lumbar puncture), have not been found to be of value as a routine test in the diagnosis and evaluation of recurrent headaches. Electroencephalograms (EEGs) are not recommended in the routine evaluation or management of children with headaches. However, in the rare instance a child has an aura that goes on for some time or is very unusual, the EEG might be used to consider the possibility of a seizure disorder. Specifically, the EEG is not recommended to exclude a brain tumor or an aneurysm. In addition, EEG abnormalities can arise just from the migraine itself but fail to distinguish between those temporary abnormalities and the more persistent abnormalities that accompany brain tumors. These are termed false positive results. They are not diagnostic or predictive and only lead to the consideration of more invasive and unnecessary tests. Neuroimaging, such as computed tomography (CT) and magnetic resonance imaging (MRI), is not part of the routine diagnosis of headaches. However when a child’s clinical symptoms do suggest the possibility of a brain issue and not just a headache, CT scans and MRIs are considered. Unfortunately, just as occurs with EEGs, MRIs are subject to false positive abnormalities. In children experiencing a migraine with and without aura, abnormalities called white matter lesions (WML) have been found. However, these “so called abnormalities” are no more common in these children than in children without migraine. It is important to understand, WML do not change; they are unrelated to the duration or severity of the headache problem and they have not been found to become strokes. CT scans and MRIs require cooperation from the child (i.e. holding still for many minutes). While some older children may be able to accomplish this independently, most young children’s cooperation is impossible without sedation. Oral sedation can be used but is unpredictable as to how much sedation will be achieved. For many children the skill and services of an anesthesiologist are a necessary part of the neuroimaging. The addition of this second invasive procedure makes the test’s performance complex, with some additional risks and more expense. For example, a CT costs hundreds of dollars, while an MRI (not including the anesthesiology procedure) will be several thousand dollars. The CT scans and MRIs are usually covered by insurance, but the variables of type of facility, specific medications used and many other considerations make it important to verify coverage in any situation (especially in a non-emergency setting). It is important that parents remember the value of time. If a child’s headache has been recurring for a number of months and their physical and neurologic examination is normal, routine neuroimaging is not likely to find any abnormalities that either need to be treated or improve understanding of the child’s headaches. Once the parent and the child’s medical professional begin to discuss treatment plans, there is a solid assurance that the problem is just headaches. While having headaches certainly hurts, it also produces a level of anxiety in the parent (i.e. “Is there a brain tumor present?”) and the child (“What’s wrong with me that my head is hurting so much?”) that must be diminished as clearly and as soon as possible. This reassurance can and will provide a sense of relief that will allow a parent to more calmly approach the problem as a headache in and of itself. How many of the child’s activities require extra effort to complete? Are the activities performed with a negative, complaining attitude? Answers indicate how much the child’s activities are functioning at 50% efficiency. Have parents compare this level of dysfunction to their own life. That is, if they missed work or functioned as poorly functioning as this at their jobs would they lose their job or if they own their own business would their business fail? The answers to these questions will guide parents and their healthcare provider in the direction and intensity of their child’s medical needs. For all children, whether they have a few or many headaches, an analysis of what might be causing their headaches is necessary. It is not, however, necessary to sort out what causes all of their headaches. Sometimes, identifying what factors are aggravating an underlying biologic condition is helpful. An aggressive elimination diet can be used to analyze any dietary triggers; however, it is difficult and unlikely to be tolerated in younger children or cooperated with by an adolescent. Conversely, the headache diary is a simple tool and is not as rigid as an elimination diet, which allows for more success. The headache diary is a daily record of all activities, foods ,and medications that a child has experienced. It also records the number of headaches and the headaches’ characteristics. Some of these dietary reactive headaches have a very short latency – the period between when the food item was eaten and the headache begins. For example, a child may experience headaches during a meal where MSG was ingested. Eating salami or chocolate may produce a headache hours later. These time frames point out that the period between food ingested and headache may vary from minutes to hours. However, it is not reasonable to blame the headache on something that the child has eaten three days before. Caffeine deserves a special note as the cause of headaches for two reasons. First, it acts as a stimulant that can disrupt sleep and affect daytime mood. Secondly, when caffeine is discontinued, it may produce headaches or increase existing headaches. An irregular or ineffective sleep pattern is accepted as ordinary in many adolescents. For those children who experience migraines, the establishment of a regular sleep schedule is a necessity to minimize this aggravator of headaches. The ordinary stressors of home and school life may also trigger headaches in some children. Marital stress, as well as parental occupational issues, can translate into a physical reaction in children. Academic and social pressures, such as social pressure to fit in, bullying or having to deal with lack of confidence, are elements that are not always seen by some parents as headache triggers. Moreover, the child who is suffering from headaches and appears to rarely take or be given any medication may be found to have been inadvertently overusing “over-the-counter” medication. While these issues may seem obvious, they should be addressed up front and not assumed in each and every instance. A variety of alternative medicines – sometimes called nutra-cuticals (i.e. herbs and dietary supplements) – have been claimed to abort or prevent headaches. However, the evidence is not convincing that it is any more effective than a sugar pill, with only a few showing benefit in prevention. The responsibility and the authority to deal with any triggering events or situations is that of the parent except, however, for children approaching or at adolescence. For example, it would be a rare teenage boy or girl to give up soccer to prevent their occasional soccer match triggered headaches. The child who has a very common, mild, non-nauseating headache, usually in a circumstance that leads to a reasonable cause-and-effect conclusion, is not likely to come to special medical attention. When the headaches become frequent and when the headaches are individually disabling because of severity or associated symptoms, parents will and should seek medical consultation. Most studies of the effectiveness of headache treatments have been done with adults. Only a few studies have been done on the effectiveness in children. As a result most headache medications are approved for adults by the Federal and Drug Administration (FDA). However, ibuprofen and acetaminophen are recognized to be effective for migraine in adolescents. For these and most of the other over-the-counter medications, their use is common and in the hands of an experienced practitioner reasonably managed. The NSAIDs (non-steroidal anti-inflammatory drugs) have wide use in children for a variety of conditions. Headache is just one of them. Acetaminophen (TylenolR) and the NSAIDs ibuprofen (MotrinR) and naproxen (AleveR) are used frequently. Additionally, they come in a variety of formulations designated to be pleasant and easily administered to children of a wide variety of ages. As abortive agents they are likely to be effective for tension-type headaches and can be administered several times a day. It is important for parents to avoid the frequent or prolonged use of the above-mentioned medications. The child whose headaches have persisted for weeks with only an occasional break or the child who has had multiple, week-long episodes of headaches are most at risk for having rebound headaches. Health care providers report these at-risk patients have been inadvertently administered over-the-counter medication for several days; the only relief from individual episodes has come from a number of days of exhausting headaches with accompanying deep and prolonged sleep. This is the phenomenon of analgesic overuse or rebound headaches. A common scenario would be analgesic (pain) medication is taken to relieve the headache. The relief is short lived and the medication is taken again. Each time the medication wears off (is metabolized) the headache returns and eventually will become continuous. The answer for this phenomenon is unfortunately primarily abstinence. If this pattern of rebound is solidly established, it may take several weeks for the cycle to resolve. Total abstinence from all medications is preferable, but may not be tolerated. If some medication appears to be needed, a couple of doses each week may provide a somewhat longer but similarly effective treatment. In very rare instances, hospitalization and the use of intravenous medication has been needed.. It is common in these situations for an underlying migraine problem to exist. However, the true severity of it is impossible to sort out until the rebound has resolved. For the child with occasional migraine headaches, the medication approach is actually simpler. While work continues on the pharmacologic treatments closer to the core biology of a migraine, there is a class of medications available in the United States for the past twenty years that is successful in treating migraines. This medication class is called “triptans”. Triptans work by enhancing the action of serotonin (a natural chemical that transmits information from one nerve cell to another) at selective sites on the vessels of the brain called receptors. In doing so, these agents, formally known as 5HT1d/1b agonists, can reduce the inflammation that originates in the nerves which is associated with migraine. While anecdotally successful in migraine treatment, triptans have not been approved by the FDA for children under 12. Experienced medical providers will use triptans in an off label fashion for children with migraines. Triptans are most effective when taken early in the headache. If the child’s medical provider has prescribed a triptan and the parent or the child can recognize their headache sequence, the course of action is set. The child should take or be given the triptan as soon as the headache pattern is recognized. To start with over-the-counter analgesics and to proceed to a more potent perhaps narcotic analgesic before using a triptan, limits the effectiveness of any triptan. While triptans may work later in a headache, their efficacy diminishes rapidly after the first 30 to 60 minutes of a headache. This applies to subsequent headaches as much as it does to an individual headache. Unless a basic analgesic has been rapidly and sustainably effective in a previous headache, a triptan should be administered as soon as the migraine pattern is recognized. Triptans come in various formulations. Sumatriptan (ImitrexR), for example, comes as pills, nasal spray and as a subcutaneous (under the skin) injection. Few children will need or tolerate the injection, especially as a first option; however, this formulation is most associated with rapid, total and sustained relief. Two agents, sumatriptan and zolmatriptan (ZomigR) come as nasal sprays. These are reasonably effective, but they need to be administered with the child leaning forward so that the medication is absorbed in the nose and the amount swallowed is minimized. Swallowing isn’t harmful to the child; but it is less effective in treating the migraine and patients report an unpleasant taste. Zolmatriptan and rizatriptan (MaxaltR) come in an under-the-tongue, orally-dissolving tablet and are available in respective flavors. For example, zolmatriptan is available in orange flavor and rizatriptan in peppermint. . This formulation has the possible advantage of a more rapid adsorption, as well as eliminates the need to swallow a pill (which may avoid vomiting of the medication). All of these factors may make administration in a younger child more pleasant. Some of the triptans only come in pill form. They are eletriptan (RelpaxR), almotriptan (AxertR), frovatriptan (FrovaR), and naratriptan (AmergeR). Others come as pills as well as the other formulations. These medications have all had studies reporting their effectiveness, their persistent benefit (i.e., eletrpitan), and their sustained duration of action (i.e. frovatriptan). However if a triptan is to be used in a child, the deciding factor for an initial agent may be more formulation (oral, under the tongue, nasal spray, injection) and flavor than any technical factor. The cost of these agents may easily amount to several hundred dollars a month. Generic versions are available (at this time) only of naratriptan and sumatriptan pills, nasal spray, and injection. If the child’s migraines remain infrequent (no more than a couple per month or lasting a handful of hours or less) but further improvement is desired, an alternative second or even third alternative triptan may be considered. The possible advantages of any of the triptans over another are ultimately going to be secondary considerations to the concerns of acceptance and cost. Side effects of triptans are generally mild for adults and children. Many patients will feel a tightening of muscles. If the tightening is over the scalp, it may be mistaken as a worsening of their headache. If the tightening is over the chest, it may be wrongly interpreted as of cardiac origin. Warning the parents and child about this will lessen many of their fears. Concerns about heart attacks from triptans in some adults are not relevant to children unless they have major genetic and acquired predispositions to atherosclerosis. If the abortive treatments of headaches have failed to meet basic patient goals (i.e. rapid, effective, sustained relief, tolerability, and practicality of treatment). The severity, duration or frequency of the individual attacks has created real disability. The most effective strategy is avoidance of precipitating agents, medications, foods, activities and the modification of social situations and psychological stressors. This may not always be possible. A child can stop eating chocolate but Mondays will happen every week. Cyproheptadine (Periactin), an antihistamine, has been of modest benefit. It, on occasion, can produce sedation and it may increase a child’s appetite. Beta-blockers, such as propanalol (Inderal), which initially was used as medication to treat high blood pressure, has shown benefit in treating children of a wide age range. However, its side effect profile includes sedation and depression, leading some health care professionals to abandon its use. Amitriptyline (Elavil) originally released as an anti-depressant over 50 years ago, also has had inconsistent benefit in studies of children with headache. Some health care professionals have noted a small bedtime dose can be an effective migraine preventative. The anticonvulsants sodium valproate (Depakote) and topiramate (Topamax) are agents that have had good success, with supportive studies, as headache preventers in adults but studies in children are unconvincing. However, the use of these medications can be beneficial. As these anti-convulsant medications are approved for use in young children with epileptic seizures, any caution to be exercised in their use is one of relative benefit, not special pediatric side effects. For topiramate, the side effects of most concern are drowsiness and loss of appetite. For sodium valproate, weight gain is a primary concern. side effect Birth defects may occur if the patient becomes pregnant while taking the medication. Agents originally released for other conditions (e.g. anti-convulsants, anti-hypertensives, anti-depressants) have also been used with reasonable safety, but with even less clear benefit. A small study of yoga therapy in adults in India produced a modest reduction in headache frequency and severity. Acupuncture has been accepted by the National Institutes of Health as an additional alternative treatment as part of a more comprehensive program of headache management in adults only. Other agents of either modest or uncertain benefit are feverfew, coenzyme Q10, and butterbur. Butterbur is the one agent in this group that had had a single trial in children; the trial showed a modest benefit. These agents are not without risk, as their preparations are unregulated. For example, butterbur contains substances that can cause liver damage. Vitamin B2 (riboflavin) has been beneficial in headache prevention in adults. Magnesium oxide (NOT salicylate) has also proven to be an effective agent. None of these agents should be given without consultation and careful monitoring by a child’s medical professional. For any preventative treatment to be evaluated properly, both the parents and the child need to be committed to the course of action. Treatments should begin with gradually increasing doses if needed and tolerated. Treatment should be continued long enough to make a judgment comparing the frequency and severity of the migraine attacks while taking the medication versus the period before the medication had been begun. Typically, a three to six month period is necessary. Great care must be taken to avoid adding one medication on top of another even if the above precautions have been exercised. Preventative treatment is not “forever” treatment. A child’s headache pattern is likely to change over time. Consequently, attempting to decrease or discontinue the preventative treatment may be considered once the frequent headache pattern has been broken and a satisfactory and effective response to the occasional breakthrough headaches is in place for six to nine months. Unrecognized and unaddressed, a child’s headaches will result in social, academic, and psychological distress and disruption. While some children’s tension type headaches will transform into migraine; about half of all children will not continue to have disabling headaches into adulthood. Of those whose headaches persist, many will have more inconvenient than disabling headaches. At present, predicting who will have longstanding or disabling problems from their migraine is not possible. There is some early information that may in the future lead to a blood test that measures specific migraine-related peptides between headaches that will meet this need. In the meantime, it is only with early effective headache management that the best possibilities of long-term headache minimization can be achieved. Once a headache has been established as primary, the key to the treatment is the prompt and accurate recognition of the type of headache from which the child is suffering. This understanding should be followed by avoidance of triggering and aggravating factors, as well as the establishment of a specific, individualized abortive and (when necessary) preventative therapeutic program. Computed tomography (CT): Images of parts of the body which are computed enhanced to show the internal tissues. Electroencephalogram (EEG): A continuous presentation of the ongoing electrical activity of the brain. Lumbar puncture: The insertion of a fine needle into the space surrounding the spinal cord at the lumbar region of the back. This is performed to analyze the fluid looking for infection among other conditions. Meningitis: An infection of the covering of the brain and spinal cord. Magnetic Resonance Imaging (MRI): A process to great images of the internal tissues of the body but transiently changing their magnetic characteristics. Non-Steroidal Anti Inflammatory Drugs (NSAIDs): Pain medications and also improve inflammation but are not steroids such as cortisone. Peptides: A compound composes of two or more amino acids. These are the building blocks of enzymes, proteins among other tissues. Upper respiratory tract: The part of the breathing apparatus from the mouth to the throat. Visual field: The upper, lower and side to side extent of what a person sees. Alexiou GA, Argyropoulou MI. Neuroimaging in childhood headache. Pediatr Radiol. 2013 Jul; 43(7): 777-784. American Academy of Neurology [Internet]. Minneapolis: Evaluation of children and adolescents with recurrent headache. [updated July 13, 2013]. Available from: http://www.aan.com/guidelines/Home/ByTopic?topicID=16. American Academy of Neurology [Internet]. Minneapolis: Pharmacologic treatment of migraine headache in children and adolescents [December. 2004]. Available from: http://www.aan.com/guidelines/Home/ByTopic?topicID=16. American Academy of Pediatrics, Council on Sports Medicine and Fitness, Canadian Pediatric Society, Healthy Active Living and Sports Medicine Committee. Boxing participation by children and adolescents. Pediatrics. 2011; 128: 617-623. American College of Emergency Physicians. Clinical policy for the initial approach to adolescents and adults presenting to the emergency department with a chief complaint of headache. Ann Emerg Med. 1996; 27:821-837. Goadsby PJ. Therapeutic prospects for migraine: can paradise be regained? Ann Neurol. 2013; 74:423-434. Halstead ME, Walter KD; The Council on Sports Medicine and Fitness, American Academy of Pediatrics. Sports-related concussion in children and adolescents. Pediatrics. 2010; 126(3):597-615. Lewis DW. Headaches in infants and children. In: Swaiman KF Ashwal S Ferriero DM and Schor NS, editors. Swaiman’s Pediatric Neurology: Principles and Practice, 5th ed, Philadelphia: Elsevier Saunders: 2012:880-899. Mar S, Kelly JE, Isbell S, Aung WY, Lenox J, Prensky A. Prevalence of white matter lesions and stroke in children with migraine. Neurology. 2013; 81(16):1387-1391. Prensky A. Childhood migraine headache syndromes. Curr Treat Options Neurol. 2001; 3:257-270.